In the four years since the first draft of the human genome sequence was made available to researchers worldwide, scientists have scrambled to make sense of the information it contains. One of the most promising avenues involves sequencing the genomes of other species and comparing them with the human genome to learn what makes each species unique and what elements are common to many species. Researchers at UCSC, led by professor of biomolecular engineering David Haussler, have been at the forefront of this effort. Most recently, they have been part of an international consortium of scientists involved in the sequencing and analysis of the genome of the common laboratory rat. The primary results from the Rat Genome Sequencing Project Consortium were published in the April 1 issue of Nature, and an additional 30 papers describing further detailed analyses appear in the April issue of Genome Research. The entire project involved an extensive network of research centers. After the genome was assembled, an international team, representing more than 20 groups in six countries, analyzed the results. Haussler, who directs UCSC's Center for Biomolecular Science & Engineering (CBSE), co-led the evolutionary analysis group, which also included scientists at Stanford University, UC San Diego, UC Berkeley, and Pennsylvania State University. Jim Kent, a CBSE research scientist, directed the UCSC group that worked on the genome alignments and built a rat genome browser. Haussler and Kent, along with nine others at UCSC, joined more than 220 coauthors on the Nature paper. Only two other mammalian genomes--the human and the mouse--have been sequenced and analyzed to this extent. The study found the rat genome contains some 2.75 billion DNA bases, which is intermediate in size between the human genome (2.9 billion) and the mouse genome (2.6 billion). "The sequencing and initial analysis of the rat genome confirms some recent thinking about mammalian evolution and offers new insights," Haussler said. For example, the evolutionary analysis of the rat genome confirmed earlier evidence that species evolve at different rates. As genomes evolve, they accumulate changes such as insertions, deletions, and substitutions of DNA bases. The idea of the molecular clock, introduced in 1967, assumed that changes in DNA accumulate at approximately constant rates over time. But this idea is contradicted by the comparison of the human and rodent genomes, Haussler said. "In the 75 million years since divergence from their common ancestor with humans, the rodent line has accumulated substitutions at a faster clip than the human line--almost 3 to 1," he said. The researchers also found that the rat changes slightly faster than the mouse, so there is not even a constant molecular clock among rodents. Even though the mouse and rat have evolved independently, the changes that have occurred in corresponding regions of their genomes are surprisingly related between the two species. At present there is no clear explanation. With three genomes to compare, researchers can now trace the evolutionary history of each of the DNA bases with more accuracy. According to Krishna Roskin, a graduate student in computer science, this gives scientists new insights into evolutionary events. "When something shows up in the genome of the rat, but not in the mouse and the human, we can be fairly certain that it was a new insertion in the rat DNA. On the other hand, when it shows up in both the mouse and the human, but not in the rat, it was probably deleted from the rat," Roskin said. Rodents showed more substitutions, insertions, and deletions than the human line. The evolutionary analysis team at UC San Diego also found that as rodents have evolved, their genomes have been scrambled by large segments moving from one chromosome to another. In contrast, the evolution of the human genome during this time shows little evidence of such scrambling. The actual mechanism whereby the genomes are scrambled is not fully understood. Not everything is faster to change in rodent DNA, though. The evolution in the human lineage features more duplications of DNA segments. Evolutionary analysis group members at Pennsylvania State University found that about 1 billion of the 3 billion bases in each of the genomes of rats, mice, and humans align with each other. These are thought to be an "ancestral core" that has been retained in the three species. These core 1 billion bases encode nearly all the genes and their regulatory signals, accounting for the similarities among mammals. In addition, 5 to 6 percent of the rat, mouse, and human genomes contain specific regions that have stayed relatively free of changes. This confirms an earlier estimate from comparing the mouse and human genomes before the rat genome was available. While this portion of the genome appears to be under constraint in rodents and primates, the rest of the genome appears to be evolving neutrally. The conserved segments are thought to code for and regulate critical functions of the organisms. The three genomes encode similar numbers of genes, most of which have persisted without deletion or duplication since the last common ancestor. A selected few families of genes have been expanded in the rat, including smell receptors and genes for dealing with toxins. These give clues to the distinctive physiology of the species. Almost all human genes known to be associated with diseases have counterparts in the rat genome and appear highly conserved through mammalian evolution. Biomedical researchers can mine this information for clues that could lead to improvements in the diagnosis, prevention, and cure of disease. "This is an investment that is destined to yield major payoffs in the fight against human disease," said NIH director Elias A. Zerhouni, M.D. "For nearly 200 years, the laboratory rat has played a valuable role in efforts to understand human biology and to develop new and better drugs. Now, armed with this sequencing data, a new generation of researchers will be able to greatly improve the utility of rat models and thereby improve human health." 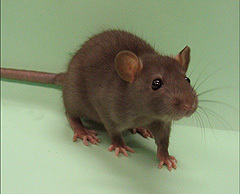 Currently, the rat plays a major role in many areas of human medical research, including surgery, transplantation, cancer, diabetes, psychiatry, neural regeneration, wound and bone healing, space motion sickness, and cardiovascular disease. In drug development, researchers use the rat both to demonstrate therapeutic efficacy and to assess toxicity of novel therapeutic compounds before human clinical trials. The rat genome sequence will facilitate research in all of these areas.